- also included: corrections etc. 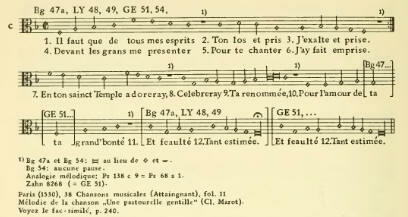 by François Lesure and Marc Honneger (marked by FS and MH), published in Revue de Musicologie, Vol. 49, No. 127 (Dec., 1963), pp. 237-244). Corrections by Howard Slenk, who wrote his dissertation on the Huguenot Psalter in the Low Countries (Ohio, 1965) are referred to as HS. In general: in this area completeness is illusory, dynamic online-databases seem more appropriate instruments. The melodies reproduced by Pidoux are numbered. p. XIII - precision - the extracts from Calvin's Institution. First colum (Institutio 1536), third quote: "Neque tamen vocem aut cantum hic damnamus, quin potius valde commendamus, modo animi affectum comitentur". The commendatory interjection 'quin potius valde commendamus' is an additon of 1539.
n° 2a - extra info - the melody a/2 (Certon) is also used by Simon Grolier for his guitar intavolation (1551). n° 3a - extra info - melody used in the Dutch Psalter for the versification of the Magnificat, 'Lofzang van Maria'. n° 8a - extra info - this melody is the same as 32a. n° 43a - extra info - text from AN41. There it is suggested to be sung ('sus') on the melody of Jouyssance vous donneray. n° 138c - caveat - link with the melody of 'Une pastourelle gentille' (Clément Marot) can be doubted. n° 201c [Decalogue]- extra info - melody for Marot's version ('Lève le cueur, ouvre l'oreille') is the melody of 'Wenn wir in höchsten Nöten sein' (also used for the hymn 'Vor deinem Thron tret' ich hiermit'). n° 203 [prière devant le repas] - 203a also in Du Chemin 1556 [HS]; 203b already in GE51. n° 204 [prière après le repas] - 204a also in Du Chemin 1556 [HS]; 204b already in GE51. n° 206 [Articles de la foy] - correction - "à partir de GE62 texte seule, sans musique" remplacé par: "à partir de GE51..."